Valpak, the savings giant, has launched a new mobile application for Windows® Phone 7, the latest addition to the suite of recently launched Valpak mobile apps for iPhone™, iPod touch®, Android™, Palm® Pre™ and Blackberry® platforms. We’re thrilled to be a part of Windows Phone Marketplace at launch. Our apps have been tremendously successful and consumers are excited about accessing savings on the go from their smart phones. 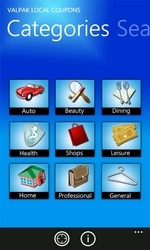 Valpak, the savings giant, has launched a new mobile application for Windows® Phone 7. The app became available on Windows® Phone Marketplace on November 8th. As the trusted leader in neighborhood value, Valpak now delivers ultra-convenient electronic coupons right to your Windows Phone 7 device. This new, free app offers quality content with more than 37,000 offers and social sharing, so wherever you go, savings will follow you. Windows Phone 7 customers can get exclusive, coupons for restaurants, auto care, entertainment, beauty, home and garden, health and medical, professional services and retail shops right in their own neighborhoods – and even when they travel out of town. Provides complete business and coupon details including location, phone, etc. Windows Phone 7 is the latest addition to the suite of recently launched Valpak mobile apps for iPhone™, iPod touch®, Android™, Palm® Pre™ and Blackberry® platforms. For questions or comments about the Valpak app, contact win7appfeedback(at)valpak(dot)com. Valpak, one of the leading direct marketing companies in North America, is owned and operated by Cox Target Media, a subsidiary of Atlanta-based Cox Media Group. With nearly 200 franchises throughout the United States and Canada, The Blue Envelope® delivers savings and value to nearly 40 million households each month. Annually, Valpak will distribute some 20 billion offers inserted in more than 500 million envelopes. Valpak also offers digital solutions with http://www.Valpak.com ®, an online site for local savings, which has nearly 40 million offer views each month, as well as for mobile devices , including apps for iPhone™, iPod touch®, Android™, Palm® Pre™ and Blackberry® platforms. For more information, please contact 1-800-676-6878.